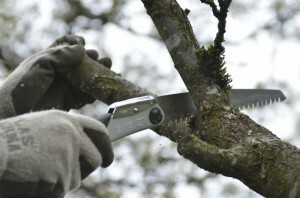 Learn the art and skill of pruning and shaping your trees. Fruit trees are pruned for a variety of reasons- to increase fruit production, thin the canopy to reduce disease prevalence, and to encourage the tree to produce fruit where you can pick it- to name just a few. 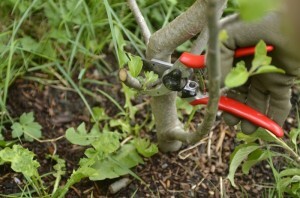 Learn why, when, and where to make pruning cuts on your trees. $155 for a lesson, up to 5 people. Additional people are $20 each, up to 10 people total. This covers up to an hour and a half of instruction and includes hands on pruning of your trees. Additional time is $75 hr ($45 per hour for community gardens, schools, and other non-profits). Pay once for a lifetime of pruning knowledge – and take care of your own trees into the future. Instruction by Lee Harrison-Smith, an ISA Certified Arborist and Tree Risk Assessor, Permaculture Design Course graduate, and plant and mushroom enthusiast. With over 25 years observing and caring for trees and plants in the Pacific Northwest . There are two general times of the year that it’s best to prune fruit trees, dormant (winter) and summer. Most people prune when the tree is dormant because it’s easier to see what and where you are cutting. But it is often forgotten that dormant pruning has a stimulating effect on the growth of the tree. That means you are encouraging new growth the next growing season- most noticeably directly below where branches were removed. This is very useful and desirable in many cases, but not all. Sometimes you may want to slow the growth of the tree. “I want to keep it small” I often hear clients say- this is when summer pruning is called for. Prune a fruit tree and you feed a person for a season, teach a person to prune, and feed them for a lifetime. Located in the Wallingford neighborhood of Seattle. Serving the Seattle area, and the Skagit Valley.